By the time the DGCers discovered the Forever Lazy, it was too late to order and brand them in time for our office holiday card photo shoot. Instead, we opted for something we were even more comfortable with: our tried and true media outlets. 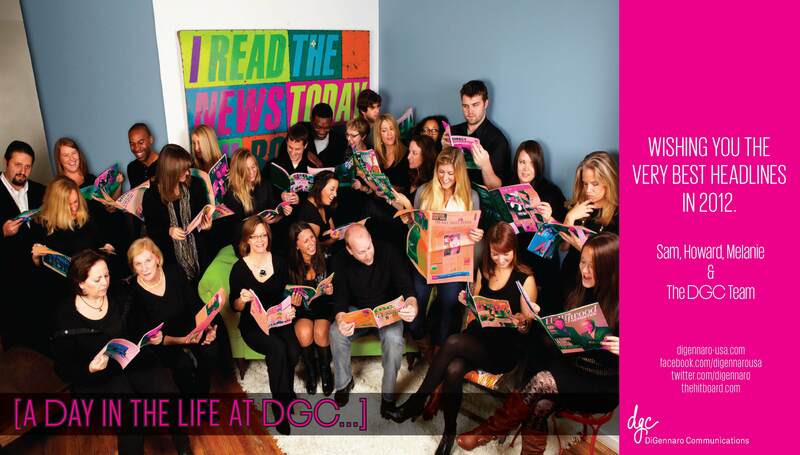 Whether laughing at a particularly amusing Ad Age article, peering creepily up from between the pages of Direct Marketing News or admiring an interview with Leonardo DiCaprio in The Hollywood Reporter, we wanted to wish our DGC network the best headlines in 2012. In addition, we’ve also spearheaded a new philanthropy effort at DGC this holiday season, participating in Toys for Tots and the New York Cares Annual Coat Drive. Arnell Group: The Arnell Group wishes all a happy holiday season with its digital snowflake card—a modern take on the paper snowflake. Blue Chip Marketing Worldwide: Blue Chip, in a clever nod to Conan O’Brien’s “If They Mated” segment, morphs its employees faces together to showcase the beauty of being “united” this holiday season. Ignited: Ignited proves that–no matter what—“there’s an app for that,” as its digital choir of iPhones sings “Deck The Halls.” Ignited will donate five cents to the Los Angeles Mission every time the video is viewed. MKTG INC: There’s nothing like some good holiday snark, and for that we can count on MKTG INC. MKTG INC’s video card infomercial advertises the “Holiday Sock”…for that special someone who complained about the brand new iPad that you gifted them last year. Modea: Modea’s Wisdom Tree of Wishful Wonders app ties with Facebook, where you can select the friend for whom you need a gift suggestion. After answering a series of questions, the app will serve up a gift recommendation for that friend. But watch out: this tree has a warped sense of humor. Wing: Wing emphasizes charity, urging people to give back to children in need this holiday season through an interactive holiday graphic. If you don’t want to get this kid a present…Wing will literally keep asking you questions until he cries. Have you seen any other great industry holiday cards this year? Please spread the cheer and share in the comments section below!